Despite a life-long love for our furry friends, Veterinary Science wasn’t Dr. Huston’s first dream. As a young child, she dreamt of becoming a dancer. These dreams were [fortunately] shattered at around 11 years of age by her mother’s statement following a dance recital, “She looked like an elephant trumpeting across the stage”. From there on out, becoming a vet was it. Danielle graduated from the University of Queensland with a Bachelor of Veterinary Science in 2010. She had already been working for Animal Emergency Service in Underwood as a vet nurse for two and a half years at this point and was cunning enough to con the Veterinary Manager into keeping her on as a new graduate intern. She remained working at Underwood AES for three and a half years before making the sea change to the Sunshine Coast, where she works at both Tanawha and Noosa practices. Danielle is currently enrolled in her final year of a Masters in Small Animal Clinical Practice through Murdoch University. The Huston family consists of two cats, Delilah and Theodore, both of whom were strays through our clinics and remained unclaimed at the pound; and two dogs, Tallulah and Pippa, both mixed breeds from rescue organisations. Their primary roles and responsibilities include keeping the bed warm, keeping the couch soft and comfy, eating anything they can get their paws on (occasionally resulting in trips to work with mum), occasionally donating blood, posing for ultrasound training and selfies, long walks along the beach for the dogs, and midnight acrobatics for the cats. Oh, and keeping dad company whilst mum works. 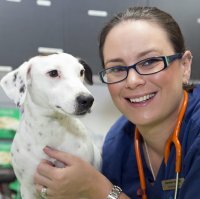 Emergency and Critical Care is a passion for Dr Huston, and she is exceptionally proud to be a part of such an amazing team providing after hours care to the animals of the Sunshine Coast. The variety of cases we treat with the combination of medical and surgical management keeps things exciting, and us always on our toes. Travel is Danielle’s favourite past time – anything from 4wd-ing weekends away to international adventures. She believes the only way to fully experience any culture is through food and drink, and the success of any holiday can be measured in kilos gained. Moving to the Sunshine Coast has allowed her love of the great outdoors to blossom, with hiking adventures a favourite and a necessity to undo the damage done on previously mentioned holidays. Danielle is also a member of a local Rotary club and enjoys this avenue of community service.